Malaysia has made its largest ever seizure of crystal methamphetamine, officials said on Monday (May 28), finding nearly 1.2 tonnes of the drug disguised as tea in a shipment from Myanmar, and arrested six suspected traffickers. Vietnam’s military-run telecommunication company Viettel Group and its partners will launch the first 4G mobile network in Myanmar next month to cash in on the Southeast Asian country’s fast-growing economy, the Vietnamese government said on Monday. A total of K1.5 billion (US$1.12 million) has been allocated for healthcare research in the coming budget year, according to U Hlaing Myint Thu, deputy director general of the Health and Sports Ministry’s Medical Research Department. Police in Myanmar examined the mobile phones of two Reuters reporters accused of possessing secret documents without a search warrant after their arrests in December, an officer told a court on Monday, in what has become a landmark press freedom case. Advans Myanmar, a microfinance institution backed by Luxembourg-headquartered Advans Group, and Yoma Bank have closed three financial transactions in March worth $1.44 million to support its operations in the country, according to an announcement. South Korean government’s Korea Land and Housing Cooperation, Myanmar’s Alliance Star Group of Companies and Shwe Taung Company will be engaged in three mega city development projects, requiring an investment of $2.29 billion, in Myanmar. Myanmar’s anti-corruption commission has in recent weeks sued a senior bureaucrat and begun investigating a disgraced minister, indicating a crackdown on corruption promised by the government is finally happening. Often criticized as weak and unambitious, the commission’s stepped-up efforts suggest the Southeast Asian country is joining a regional trend. World religious figures called for a peaceful reconciliation in religious and ethnic conflicts in Rakhine state, Myanmar, during their meeting with Myanmar’s de-facto leader Aung San Suu Kyi last week. Myanmar’s military, fresh off a bloody campaign that drove most of the country’s Muslim Rohingya minority into neighboring Bangladesh, has launched a new offensive against the armed forces of an ethnic group along the northern border with China using helicopter gunships, jet fighters and heavy artillery. The government, the military and ethnic armed groups should seek some common ground as their different goals lead to low success of peace talks, said Karen National Union Chairman General Saw Mutu Say Poe. Workers and labour advocacy groups are calling for the immediate passage of the new occupational safety and health law, which has been under discussion in parliament committee for over six years now. The European Union has extended the scope of the punitive measures against Myanmar/Burma by broadening the current arms embargo and strengthening the export of dual-use goods for use by the military and border guard police. A tick that was caught in a spider’s web 99 million years ago in northern Myanmar has been discovered in a shard of fossilized amber, giving scientists a glimpse into the interactions between ancient arachnids. Population and families have been increasing in the prohibited place where no one lives near Myanmar-Bangladesh border out of the barbed wire fencing. We see it everywhere, use it everywhere. It is the miracle material that you can use for almost anything but it is now threatening our well-being and our planet more than ever. Plastic. Myanmar has received first 62 returnees through Nga Khu Ya reception camp in Rakhine state, who had fled to Bangladesh due to the Rakhine conflict, according to a statement from the State Counselor’s Office Sunday. Myanmar Metals has secured a major Australian base metals mining company Perilya Limited as a cornerstone investor for its tier 1 Bawdwin polymetallic deposit in central Myanmar. 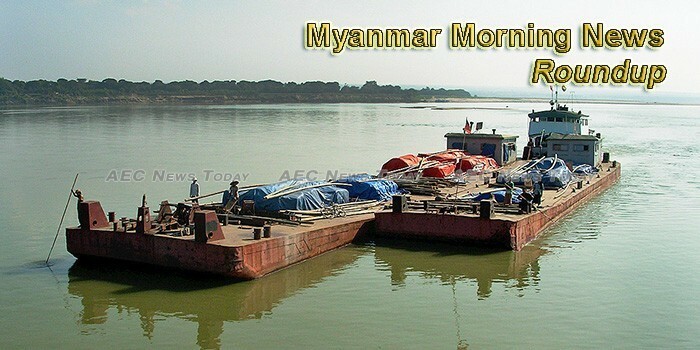 Trade between Myanmar and Sweden reached US$55.848 million in the 2017-2018 fiscal year, which saw a slight decrease in value by $6.148 million than the previous FY, according to the latest report of the Ministry of Commerce, quoted in state media. MYANMAR’S president on Monday nominated 80-year-old Soe Win, a well-known financial professional, as the next finance minister after the previous one resigned, amid reports he was being investigated over graft accusations. A total of 62 returnees were arrested by Myanmar local authorities for illegally crossing the border, Irrawaddy reports quoting a brief statement released yesterday by the State Counsellor’s Office in Yangon.